Sunday retail management advice: interviewing prospective employees for your retail business | A blog about smart POS software for independent small businesses. Interviewing prospective employees is a personal thing in that it is all about you and your business. Get this one thing right and you get plenty of benefits for your business. The type of people you want for your business can only be determined by you. This is why we say it is personal and why we do not advice a consistent corporate approach across all businesses. Make sure prospective candidates are who they say they are. Check photo ID. Have them bring a Tax File Number – to show they are known to the government. Have them bring two written references. Advise them before the interview you may do a police check. Stalk them on social media to look for possible issues. Interview two or three candidates. Not too many though as it can take up time when if you vet them right prior to the interview you can have a good short list. Now, on to the interview. The goal is to encourage conversation as it is from conversation that you can determine if you like the candidate and liking them is key to their future with the business. Start by asking them what they think of the business and what they would change. The purpose of this is to test to see if they know much about the business and have any interest in it beyond a paycheque. Ask them why your business. The reality is this question often elicits the answer they think you want rather than the truth. Press them on it. Ask them about any experience they have that could help them in your business. This is designed to be open ended, encouraging conversation. Usually, three or four topics in and you should have an idea if they are right for you. If the feeling at this point is they are not right for you, pull the pin on further discussion and than them for their time. Other topics worth discussing are: how they relax, their dreams for the future, whether they collect anything, what they are passionate about and whether they read magazines. Each of these topics can be open ended – encouraging further conversation. If you have a candidate you think is right, consider a paid trial of three hours. This is usually useful if you are not sure between two candidates. It is a thrill to see so many independent small retail businesses thriving through the winter of 2016. We are seeing businesses transforming from what has been traditional for their type of operation into fresh offerings that drive the appeal of the business beyond what has been traditional for them. We love seeing this not only because of the pleasure of observing success but also because of a role we can play in helping to uncover and leverage good news for small business retailers. Our commitment is to help our customers beyond the software to help them reach beyond the dreams they have for their businesses. We are grateful every day for the opportunities that come our way. Too often small and independent retail businesses create and run shopper loyalty programs that mimic their big business competitors. They ignore that the big business loyalty programs do not have rewarding shopper loyalty as a core focus. Big business loyalty programs are primarily about the needs and profitability of big business. Our advice for small business retailers is to be generous with your loyalty program. Offer generous rewards for loyalty. Run a loyalty program shoppers love, a program that brings shoppers back again and again. Being stingy will cause frustration and anger among customers, it could have them talking negatively about the business. This is not good for business. When we look at loyalty programs that have failed to deliver good results in a small or independent retail business, the most common cause we find is that the loyalty reward is not sufficiently a reward. This is why we encourage retailers to be generous in loyalty reward settings. The best way to reflect generosity is through transparency of value. By this we mean making it clear what a reward is worth. This is why a dollar amount is more valuable than points. People understand dollars. It is unlikely the will easily understand the ‘value’ of points. For more advice and assistance on the best-practice approach to shopper loyalty, please talk with the team at Tower Systems. Lay-By is a vitally important service for independent toy retailers in their competition with mass retailers like Target, Big W, K-Mart and Toys R Us. Independent and small to retailers using the toy shop software from Tower Systems have in the software terrific Lay-By facilities that enable their businesses to run a professional Lay-By service that meets regulatory requirements and that competes head-on in terms of flexibility and functionality. Now, in the middle of Winter, is the perfect time to ensure Lay-By is properly setup and promoted. This is why Tower Systems has been educating customers, to ensure they are fully prepared for the Lay-By opportunity and to ensure they are pitching the message of Lay-By opportunity to customers and prospective customers. Also, check the website of your state Consumer Affairs office to familiarise yourself with local requirements. Information there will help you determine your own terms. Meeting regulatory requirements is vital. For example, if someone cancels a Lay-By you must refund their payments less a termination fee. You can set this fee and advise as part of your terms and conditions. Our advice on the next page guides you through key rules and steps to success with Lay-bys. WHAT TO LAY-BY. Set a minimum item and or purchase value. We’d suggest $80.00. DATA REQUIRED. Always ensure you are satisfied you know who your customer is. Require proof of ID from a driver’s licence or similar legal ID document. DEPOSIT. 20% of the total GST inclusive purchase price. AGE. Only Lay-by to people 18 and over. DURATION. Lay-bys should run for between eight and twelve weeks. You could run for longer pre Christmas to get early toy sales. PAYMENT CYCLE. Require payments to be made weekly or fortnightly. PAYMENT METHOD. Accept any payment form you choose. BREAKUP. Do not allow someone to take home a single item from a group of items on Lay-by together in one purchase. It’s all or nothing. CANCELLATION. Have a Lay-By termination policy you are comfortable with. We suggest a 20% termination fee. Alternatively, set a dollar amount to reflect the work. Also, consider setting the Lay-By to auto terminate if it extends beyond a period of time you nominate. Note that you could equally choose to have no cancellation given that Lay-by product may not be able to easily re-sold. BREACH. Decide what you would consider a breach. This has to be something you stand by. We suggest two missed payments without reasonable excuse or rectification. On breach, cancel and charge the cancellation fee. EXCHANGE. We suggest a no-exchange policy. DOCKETS. When a customer Lay-bys, print two dockets – one for them to take immediately and one to be placed with the goods. Have your customer sign both copies, accepting your terms and conditions. STORAGE. Set aside a clean and secure storage location for Lay-bys in your business where locations are coded for easy finding. Place Lay-by goods into a single clear plastic bag per transaction for clean and safekeeping. Staple to this a copy of the Lay-by docket. Let your customers see you do this so there is no doubt when it comes time to collect the products. MANAGEMENT. Have one person responsible for Lay-bys to ensure product care, track payments and contact customers. TERMS AND CONDITIONS. Enter these into your software so they are included on every Lay-by docket. Points 2 through 11 above are a good example of what to include in your terms and conditions. COMPLETE PAPERWORK. To not over complicate things, rely on your software’s Lay-by docket as your complete paperwork / contract. Get that right and Lay-by management will be easier. These rules and steps may feel complex. They are necessary for the small number of times something goes wrong and you need to rely on them to help you deal with a situation. The latest jeweller shop software from Tower Systems delivers enhancements developed in close consultation with independent jewellers. These enhancements include even better facilities for professionally serving customers with elegant customer-facing documents as well as facilities unique to jeweller businesses. Working closely with jewellers, our team continues to evolve our jeweller software to serve the unique needs of jeweller businesses, to ensure the software helps the jeweller businesses themselves evolve. These things separate Tower Systems from Retail Edge, ARMS and Swim. We train you in your business, face to face. Our support is Australian based, 24/7 and specialist to your needs. We develop the software. We are not agents. Our software is developed for you. It is not US or Chinese software. You have access to more than 130 training videos. You have access to a comprehensive, self-serve knowledge base. Facilities in our jeweller software include: sales, customer loyalty, integrated eftpos, repairs management, special orders, gift cards, employee tracking, inventory management, specials / catalogues / offers, web-store interface, Xero interface, product care instructions, customer follow-up marketing, performance reporting, theft management, second-hand goods management, bundling pricing, servicing assistance / management, employee rostering and plenty more. Inventory in retail is worthless unless it sells. The longer it sits on the shelf of a retail business the greater the cost of the inventory to the business. A good basic inventory management principle is: never let a stock item celebrate a birthday. That is, never have an item in the business for more than a year. In fact, we would suggest six months is too long for most items. Using good POS software you can easily track how long a stock item has been in the business. Stay on top of the age of an item. Work the item to ensure it does not celebrate that birthday. Focus on placement, promotion, adjacency and more to ensure the item is turned within the time necessary for you to achieve a good return for the business. Ensuring all team members working in the business understand your commitment to never let a stock item celebrate a birthday will help make this happen. You could take the commitment a step further. Put a sign up in the back room. Make it a discussion point at staff meetings. Encourage anyone to run a report at any time on the age of inventory in the business. Make everyone accountable for the mission. Tower Systems regularly offers advice to retailers beyond what is usual for a POS software company. The advice demonstrates our commitment to helping beyond the software, to add value to the relationship to benefit the whole of the business. Here is another video from our in-house production team. We like the video for its practical content for small business retailers and for the professionalism it reflects. We produce new videos for our customers regularly, training videos on how to use our software, videos to help encourage confidence in our software and the difference it can make in a business. 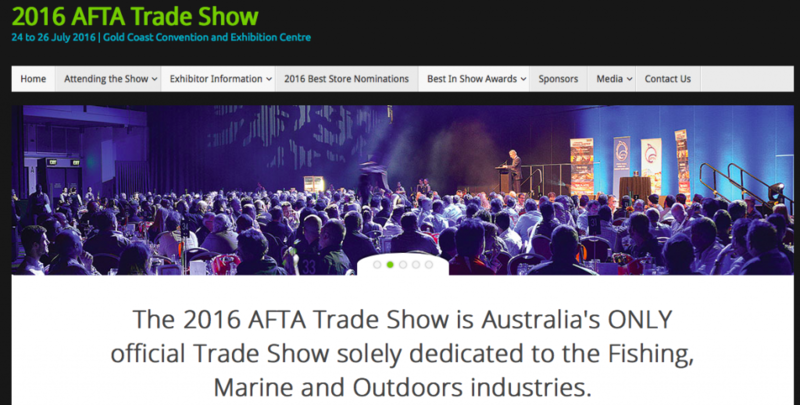 We are thrilled to be part of the AFTA show on the Gold Coast for several days this week. On our stand we have been showing off our terrific fishing and outdoors business software. Here are some photos of the event and our engagement. Yesterday was excellent. The next two days should be as good. Retailers have a love-hate relationship with spinners. While some have a rule of no spinners, in many situations they are necessary. Here is advice designed to help any retailer make the most of the spinner opportunity. Keep them tidy. Duh! This is very basic advice. But it needs to be said. Daily you should have your spinners checked and tidies. Move products to the front, keep products clean, pose products to show them off, if appropriate to the products. Keep them full. A half empty spinner will not work as well as a full spinner. This is retail 101. If you plan to keep a spinner for the long term, order stock regularly to keep it full. We know that a full spinner usually achieves around 20% more sales than a half empty spinner. If a spinner is a one-shot – get it in, sell it down, take it off the floor – once it starts to look empty, consider taking all stock off and placing it elsewhere in-store. Leaving it on the floor and half empty will hinder sales. Move your spinners. One a week tweak spinner locations to keep your shop floor story fresh. Have a plan. Don’t move them just to move them. Move them to drive sales – to get the products considered by people who may have missed them so far. Respect the brand. Never put product on a branded spinner that is not from the brand. Not only would such a move disrespect the brand it makes you look like an unprofessional retailer. Use thoughtful adjacencies. When placing spinners next to each other, think about the shopper and what they are looking for. This will encourage a shopper attracted to a spinner to consider the products on the spinner next to it. Avoid orphans. There is nothing sadder than a lonely spinner at the back of a shop. It’s usually half empty and looking tired and sad. It does nothing for the products or the business. Find it some friends or remove the stock and throw the spinner out. Spinners have a limited life. While a spinner for which you no longer have the original product can be useful for displaying other products, don’t work the poor thing beyond its useful life. Hideously bent wire, cracked and broken pockets, no signage, seriously chipped paint, broken casters … these are all indications that the poor old spinner ought to be tossed out. Leverage traffic hotspots. This only works with certain products on spinners – locate the spinner next to high traffic generating products such as weekly magazines, newspapers, lotteries etc. The products need to be products shoppers of the destination items will purchase. Leverage seasons. Around your cluster of cards for Christmas, Mother’s Day, Father’s Day etc place spinners with products appropriate to the season. 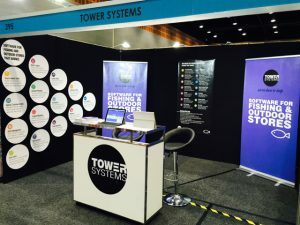 POS software company Tower Systems is proud to launch Australian designed and developed POS software for fishing and outdoor stores in Australia and New Zealand. 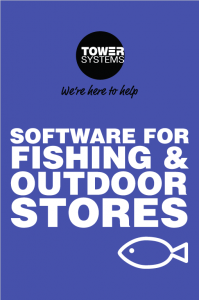 Launching officially this weekend at the AFTA show that starts tomorrow on the Gold Coast, our software for fishing and outdoor shops is comprehensive in what it offers. It benefits from already being in use in fishing and outdoor businesses, businesses that guide the further development of the software. Backed by professional installation, training and support service, our software is comprehensive and capable. Selling by weight – scale integration. Shopper discounts based on volume purchases. Text message integration for communicating local area information to customers. MailChip file import to enable easy emailing. Use advice included on receipts as appropriate to items purchased. Serial number tracking. Xero integration. This list is in addition to POS software, inventory management, supplier management and theft integration tools. 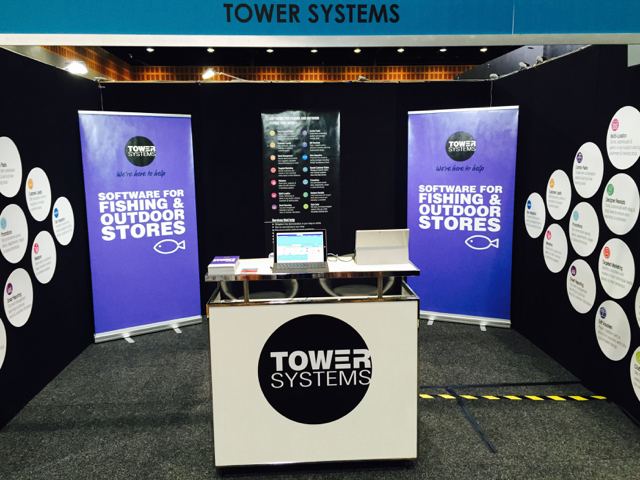 We are thrilled to be bringing our fishing shop software to the Gold Coast this weekend for the AFTA trade show. 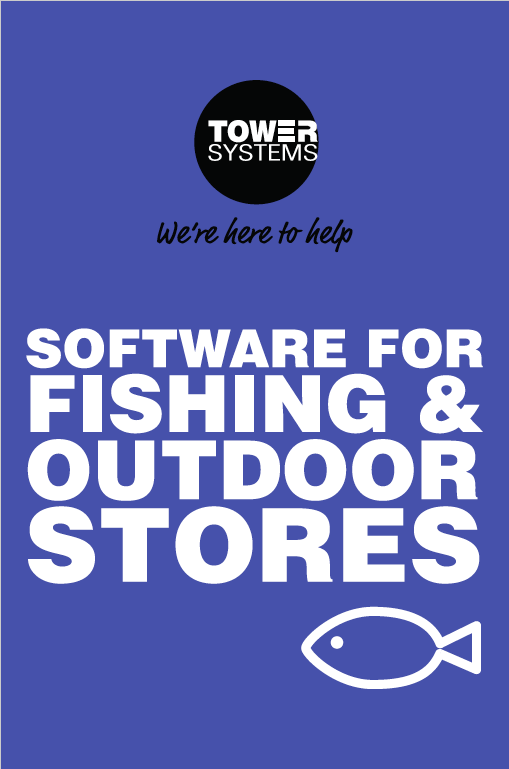 This software is ideal for bait shops, game fishing shops, recreational fishing shops and other outdoors businesses. It is in use in businesses in this channel, hence our opportunity at the AFTA trade show. Small business retailers using the repairs management software from Tower Systems can rely on the software to streamline operations, reduce paperwork, improve customer service and deliver outcomes that help the businesses grow repairs revenue. the repairs facilities in our software have been developed in close consultation with customers across a variety of retail channels. Plus, the repairs software is regularly enhanced – too deliver evolving solutions to meet evolving needs. Tower Systems serve a number of specialist retail channels with repairs management software appropriate to the needs of businesses in those channels. Initially developed in response to the needs of our jeweller customers, these features are now utilised by clients in a number of different retail markets. In Jewellers: Jewellery and watch workshop repairs, dated manufacturing. In Bike Shops: Bicycle and tricycle repairs, warranty returns. In Garden Centres: Landscaping services management. In Firearms Stores: Gunsmithy and equipment repairs, warranty returns. In Pet Shops: Aquarium installations. Repairs management software is flexible, serving a range of needs outside managing the actual repairs themselves. The flexibility in the software enables it to be used in different businesses for different purposes – from job management, to workshop management and traditional repairs management. The software tracks the labour and resources used from a billing and inventory management perspective. It also handles allocation of repairs or parts of a repair to venues outside the business (for contracting and supplier exchanges or repairs for warranty issues, for example) and tracks repair staff and couriers used in shipping repairs. Once the repair is ready for pick-up by the customer, the software finalises the billing and advises the customer by SMS or another preferred method. Payments are processed with the usual depth of our retail software’s point of sale functionality – customers can make multiple payments against a repair or a specialist manufacturing, pay through cash, EFTPOS, PayPal or other methods. Tower Systems streamlines the repairs process, facilitates good communication and helps bring management certainty to the overall repairs process in your business. It helps local independent businesses provide the kind of professional, personal and efficient repairs services that major corporate stores and online-only offerings can only dream of. Serving a number of specialist retail channels gives Tower Systems the opportunity to provide more comprehensive and flexible repairs/job/manufacturing management software. Our customers continue to provide feedback and influence the development and support of this software feature, from firearms stores to bike shops and more. P1. This is if your system is down. The most urgent call we can get. P2. Urgent. We will deal with the call ahead of all others except P1. P3. Pressing question But system not down. Return call goal 2 3 hours. P4. Non urgent question. Goal of returning a call in 4 – 5 hours. In allocating a call priority please take care to accurately reflect the situation. Speed is vital at the sales counter of any retail business, especially in small retail businesses where labour costs are constrained and more has to be achieved with less. Tower Systems helps small business retailers process transactions quickly with attention on POS software design and execution for fast throughout. Sales transaction time is further cut with our standard computer hardware spec requiring solid state drives. SSD technology delivers excellent response times compared to the older and cheaper HDD technology. Tower Systems reset its HP computer specs ages ago to SSD to setup small business retailers for faster throughput at the counter. The result in businesses using the new technology is terrific. The result from customers has been terrific. They are thrilled with the results as are we. The combination of elegant and efficient software running on best practice fast hardware is a speed at the counter retailers and their customers love. We showed off the speed of SSD over HDD in a shoot-out video we made in house showing load and other times – so our customers could understand the speed difference between current (SSD) and old (HDD) technology. The Tower Systems POS software e-commerce strategy is delivering online sales to small business retailers. 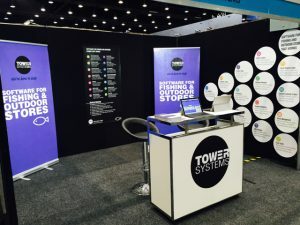 Representing a group of small business retailers under a common international brand platform the Tower Systems developed and managed website provides live stock availability to more than 200 retail businesses. This enables shoppers of the sought after brand to find local shops with stock. Linked live to the independently owned retail businesses, the website provides a national view of stock availability for online purchase as well as in-store purchase. Online purchases can be shipped or collected in-store. Transactions are secure, without credit cards being accessed by the website nor are they stores in and POS system in the store. The small business retailers that are part of the e-commerce strategy love that they are winning retail revenue from online sales without having to develop or maintain and online presence. The solution for their businesses is considerable and low-cost. This is a best practice approach to online for small retail businesses today as it is fast, easy, accurate and national in its presence. The Tower Systems desktop and web teams have worked together to deliver a series of websites, the first of which launched in 2015 and more have been added since. Using the latest web development tools, the solution from Tower Systems helps small business retailers embrace online in a genuinely unique and valuable way. Hundreds of newsagents have switched their software to Tower Systems. We can connect you with reference sites who will speak to the commercially valuable difference between our software and what you use today. We will not leave the newsagency channel. With more than 1,750 newsagent customers today we are here for you. We will fight for you. Beyond our software, outside of support, we will help with supplier issues, business strategy and other challenges you confront. No locked-in support. Taking support coverage is optional. We never block access to your software if you choose to not take support coverage. Fast support. Most calls are handled when you call. If not, we call back fast. Easy management access. The leadership team of Tower Systems is available if you need them. We take customer service seriously and personally. Updates when you choose. You are in control of when you load updates. You are listened to. We offer the only transparent, user driven, software enhancement suggestion service. All our customers are listened to. Regular user meetings. Around the country, in city and regional locations – we offer free face to face training and networking through the year. Free training. Long after you install our software you have access to free personal training to refresh knowledge or provide training on new facilities. More integrations. Our direct links to Xero, Magento, Shopify and more mean you have more direct link options to help you grow your business. The Tower AdvantageTM. Our professional and friendly help from training to support to business advice. We are not your average software company. Owner access. Our owner, Mark Fletcher, is easily accessible: 0418 321 338. You can purchase our software, lease it or even rent it by the month. You choose the path most appropriate to your needs. We make doing business easy. Tower Systems has more newsagents using its software than all other newsagency software programs combined. Basket analysis is the analysis of products purchased by transaction – shopping basket. Such analysis typically compares two trading periods overall and by day of week. It also includes this analysis by supplier comparing trading periods and day of week. Using the Tower Systems POS software, retailers are able to dig deep into basket data in recent times and into the past, to gain insights into the performance of the business for the benefit of the business and those it serves. Basket analysis shows the efficiency of product categories (departments). For example, see how many baskets include one category of item and nothing else. You can also see the numbers of times sales are single item sales. Basket analysis underscores the value to the business of newer categories such as gifts and toys. Basket analysis at a supplier level is equally insightful, allowing you to compare the basket efficiency and value of suppliers between two tradition periods as well as across each day of the week between two trading periods. It is at the basket analysis level that you can determine product efficiency. A product is more efficient for you if it is purchased with other items in our view. You can drive this by careful placement on the shop floor, promotion at the sales counter and working with customers on the shop floor to guide their purchases. It’s an example of how you can use comprehensive business data to drive your in-store actions. For example, knowing what we know about pop vinyls, Saturday is the day we really focus on them with secondary locations to do even better from the Saturday opportunity. Basket analysis can also help you with rostering. With some category sales requiring more staff time that others, you can consider the product mix sold by day and adjust your roster accordingly. Trimming wages is an important cost saving focus in business. The goal has to be deeper baskets (more items per transaction) and a greater spread across product categories – but with a focus on higher margin items so that also lift the overall GP performance of the business. In the Tower Systems software the report to use for this analysis is the Basket Analysis Report. It provides an extraordinary insight into baskets. We often see in data from retailers an imbalance in inventory performance – 20% or fewer items in-store generate 80% of the revenue. This imbalance can often be missed if the overall business performance is good. It could be that such an imbalance is only discovered if the business falls on hard times and more thorough analysis of business performance is undertaken. Using the Ranked Sales Report in the Tower Systems POS software you can quickly and easily see the top performing inventory items based on revenue or unit sales. Either metric could be useful in different situation. Our advice is to run the Ranked Sales Report for a three, six or twelve month period. Look at the items in, say, the top 100 and determine the value of those items to your business compared to the rest of the business. Usually, such analysis highlights inventory challenges business owners want to address by achieving greater balance of sales across more inventory items. This does not mean holding back the top performing lines. Rather, it means working on those outside the top performers, working on their success through work on placement, promotion, staff engagement and other factors over which you have control. The Ranked Sales Report provides excellent insights into comparative performance of inventory items. The goal is to guide you to achieve greater balance so your business relies less on the star performers. The danger of relying on star performers is the impact on the business should one or two stars fall. The more broadly based your business the better positioned it is to weather competition, challenges or a decline in one or two items. Broadening the base of your business from an inventory perspective strengthens the business. We are happy to assess your Ranked Sales Report for you. Contact support and ask the settings we’d like, run the report, save it as a PDF and send it to us. We will share our feedback. The Tower Systems Knowledge base continues to expand with weekly enhancements. We add new articles and update existing articles. This makes the knowledge base a living thing for our customers, offering fresh insights and advice through which they can learn more about how to use the software. Here are knowledge base enhancements in the last few days. Our POS software customer in their weekly email get a more comprehensive list … weekly. Here at Tower Systems we welcome new customers in a professional way – regardless of they are new because they purchased our software or new because they purchased a business running our software. We send a welcome pack with our contact details. We offer access to up to date software. We offer to review their data to guide how they can reset the business they have purchased from a tech perspective, reflecting the mission of the new owners as it may be different to the mission of the old owners. Since our customers are not a number or a faceless relationship, we bring on all new customers in the same consistent way, delivering confidence they are partnered with a POS software company that cares for and about them and and providing a pathway forward focused on the best-practice use of our software to help the business achieve for them the goals they have. Too often we see people buying a business become disconnected with suppliers because of a poor hand-over by the vendor or because of a disconnect with suppliers. Here at Tower Systems we don’t want that for any of our new customers. This study is based on data from 161 newsagencies in city and country, high street and shopping centre situations, newsagencies in different groups and trading alone. Overall, Q2 2016 delivered better results than Q1. There is good news in these benchmark results, especially for newsagents who are working their business as retailers. Customer traffic. 57% of newsagents report average decline of 1.4%. Overall sales. 59% reported an average revenue decline of 2.2%. Basket depth. 64% report a 1.9% decrease in basket size. Basket dollar value. 61% report a decrease in basket value of 1.1%. Discounting. 35% of respondents use a structured loyalty offer such as points or some other discount. Magazines. 78% of report an average decline in unit sales of 7%. The average decline in weeklies was 8.4%. 20% report an increase in unit sales. Newspapers. 77% report average decline in over the counter unit sales of 6.1%. Greeting cards. 56% of report average revenue increase of 2.9%. Lotteries. 68% of those with lotteries report average decline of 5.5% in transactions. Stationery. 77% of newsagents report a decline, with an average of 1.7%. Ink. 23% of stores report ink separately. Of these, 51% reported increase of 2%. Gifts. Of the 78% with gifts, 61% report average growth of 5.1%. Note: for the purposes of this analysis I roll gift related departments such as plush, collectibles, homewares and gifts into one. Tobacco. Of the 45% with tobacco, 73% report an average decline of 17%. Confectionery. 66% of stores reported an average decline of 3%. Toys. Of the 25% with toys, 70% report growth of 4.5%. High street and regional newsagencies were among the best performers. The traditional newsagencies: papers / magazines / lotteries / cards / stationery and little or no gifts fared the worst. Newsagencies with a strong gift department performed better with cards. Newsagencies selling higher value gifts did better than those at the low (under $20) end. Newsagencies in a group usually, but not always, perform better than those not. In the successful group, the ratio of gift to card revenue continues to grow. The most significant growth year on year is in the businesses where significant shop floor change has been undertaken. i.e. increasing gifts, shifting to higher price point products, introducing homewares and / or introducing toys – but not the usual low end toys we see in newsagencies. I say the results this quarter are better than last because there is evidence of the value of embracing change. While there is no doubt that print media continues to challenge as does tobacco and lotteries, newsagents acting as retailers can achieve gains as the results show. Look at your own situation. Compare your year on year results with those detailed here. If you are doing worse, act. If you are doing better, celebrate briefly and then get back to it. There is no time to lose. We are in a period of extraordinary change and challenge on many fronts and the best way to confront change and challenge is to lean in and bring it on. The business owners of any newsagency are the single most important influence on their results. My interest in the study is as a newsagent and as a supplier to the channel through Tower Systems and through newsagency marketing group newsXpress. I want the channel to grow for selfish reasons and because it has been my life since 1981. I am invested. Gross profit: this is the goal gross profit for all product sales not taking into account any revenue or costs related to any agency business. The traditional newsagency average sits at 28% to 32%. For a newsagency focused on the future, the goal has to be at least 45%. Ratio of Gift revenue to Card revenue: 50% minimum. The goal ought to be 100% or more. If you do $100K a year in cards, target to do $100K in gifts, or more. Revenue per employee – $250 an hour minimum not including agency revenue. Revenue PSQM $4,500 – $8,500 depending on country vs. city / high street to shopping centre and depending of product mix. Higher GP lower revenue required. Overall revenue mix percentage targets: Cards: 25%; Gifts/toys/plush: 25%; Stat: 10%; magazines/newspapers: 20%; other: 15%. Floorspace allocation: Cards: 25%; Gifts/toys/plush: 25%; Stat: 8%; magazines/newspapers: 15%; other products: 15%; office/back room / counter: 12%. It’s rare you make money from an office or store room. Mark-up goals: Stationery: 125%; Gifts 110%; plush: 110%. Occupancy cost: between 9% and 11% of revenue where revenue is product revenue plus commission from agency lines. Location and situation are a big factor in this benchmark. For example, a large shopping centre business will have a higher cost than a high street situation. Labour cost: between 9% and 11% of revenue where revenue is product revenue plus commission from agency lines. Labour cost should include fair market costs for all who work in the business. (See above). If you want help transforming your newsagency business reach out for help to people you trust. The earlier you reach out the better. Here are my contact details: Mobile – 0418 321 338; email – mark@towersystems.com.au. I will help as much as I am able. Tower Systems serves in excess of 1,750+ newsagents with newsagency software. newsXpress has 220 newsagency businesses as members. Newsagents using the Tower Systems newsagency software were provided coupons for auto-serving on customer receipts to help drive shopper engagement with the Pacific magazines shopper promotion. We worked with Pacific Magazines on the production of several coupons and provided advice to our 1,750+ newsagent customers on how to include the coupons on receipts to leverage the competition opportunity. This supplier engagement on behalf of our customers is another way Tower Systems adds practical value to its customer relationships. It is a service we provide suppliers serving all marketplaces in which we have specialist software. The auto-serving of ads and coupons on receipts is something we have done for many years. This is another example of the Tower AdvantageTM. How do you know can you trust a POS software company? Trust is important in business. It is especially important in small and local business. Trust is mission critical for POS software companies. We say this because our software helps our customers engender trust in their local communities and with their customers. If our software fails, it challenges the trust local shoppers have in local businesses using our software. Retailers rely on their POS software, they trust their POS software companies to provide software that works and that it is backed with professional assistance when they need … and that it is enhanced too meet the needs of businesses as they evolve. This is why we say trust is vital in the choice of POS software for any small business. Talk to the owner. Most businesses will say this is not possible. Challenge them – see how they respond. Visit their office. This is essential to understand their capacity to serve you. Look at their website. Do they make it easy to contact them? Are the ottos real? Do the words make sense? Do you trust what they write? Are they on your level? Ask for access to their training website. See what their customer see. Ask for access to training videos. See the resources they offer for staff training. Do a Google search on them and see what comes up. Do a Google search on their owner and find out more about them. POS software company relationships are long term so take your time, make sure the business you enter into a relationship with has the capacity, stamina and desire for an equally long term relationship. POS software company relationships are personal. Ensure the POS software company you are talking to understands this. Too often POS software companies hide behind general email addresses and call centres where you do not know the name of the person you are speaking to. It is vital you know who they are because, yes, it is personal. Being personal is key to trust and trust is vital in this relationship. Our customers are hearing a new voice on our help desk with Michael, a new team member filling a new position, an additional position, on our help desk. We are thrilled to be sharing this news. The process of bringing on a new team member takes time. Welcome Michael. Note: we introduced Michael to our customers more personally in a recent customer email.